Exactly a month ago today was a relaxing Sunday at home with my boys. I’m sure we had football on in the background as we played and laid around in our lounge clothes. One of our favorite things to do on a Sunday during the colder months of the year (when we can’t be on the golf course 😦 ) is to throw something together in our crock pot for our Sunday Supper. On this particular day, I was craving a Mexican-inspired dish. I looked around for what ingredients we had and threw together something that tasted more delicious than I could have ever imagined – Crock Pot Beef Enchilada Casserole. It was fairly easy to make and it filled the house with an aroma so enticing, it was hard to let it cook before we dived in. Unfortunately, since I’ve gone back to work and taken a little break from blogging, I’ve gotten out of the habit of writing down my recipes and taking pictures while I’m cooking (typically my recipe cabinet is filled with little pieces of paper with notes of what I’ve thrown together or tried out). So, today….more than a month later, I’m going to do my best to remember all the ingredients I put into this masterpiece. Besides, I’m hoping to make this again, soon! Just thinking about it makes my tummy rumble. I’m hoping this blog post is the first of many to come in the new year. 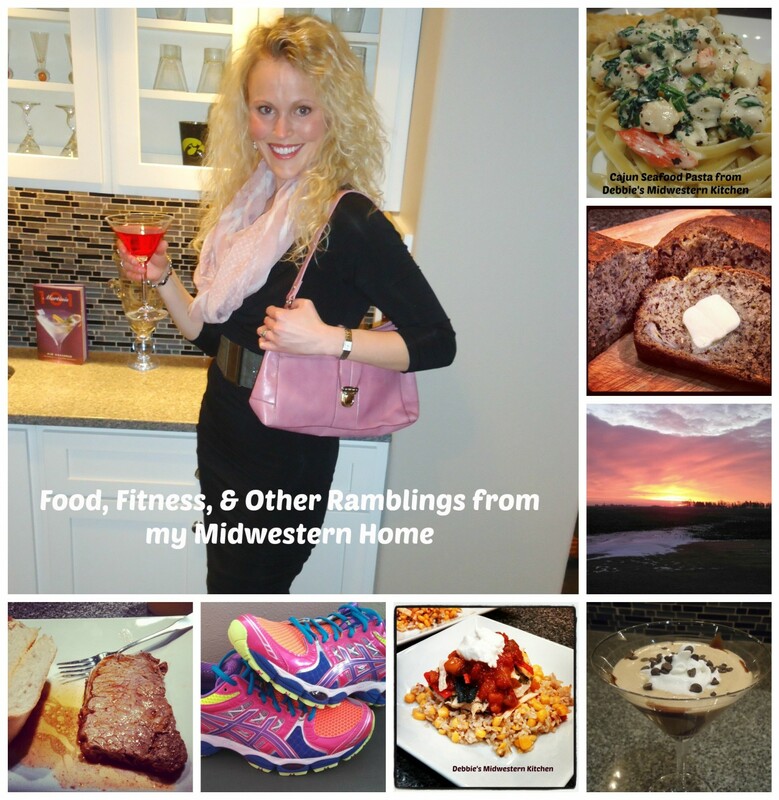 I miss sharing my recipes and interacting with all of you. So hopefully I’ll be seeing a lot more of you over the next several months! 1. Heat olive oil and garlic in a large skillet. Add onion, beef, chili powder, cumin, and garlic salt and black pepper to taste and cook until beef is browned. 2. Pour beef broth over beef mixture and then add habanero and green chiles and stir to combine. 3. Spread a couple of tablespoons of enchilada sauce across bottom of crock pot. Then lay out one tortilla across the bottom. 4. Spoon half of the hamburger mixture over the tortilla and then top with taco seasoned shredded cheese and mozzarella cheese to taste. Pour about a third of the remaining enchilada sauce over mixture. This is what your first layer should look like. 5. Lay out another tortilla to start your next layer and repeat the process above, using the rest of the beef mixture but making sure to still have some cheese and enchilada sauce left for the topping. 6. Top the entire casserole with your last tortilla and top tortilla with the remaining enchilada sauce and taco seasoned cheese and mozzarella cheese to taste. 7. Cover and cook on low for 3-4 hours. Top with sour cream and cilantro and enjoy! Looking forward to seeing more of all of you in 2015. Happy New Year! 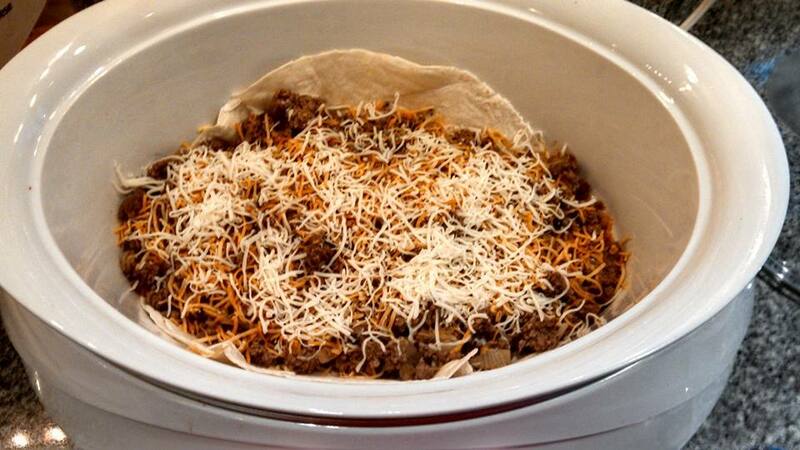 I love crock pot meals! 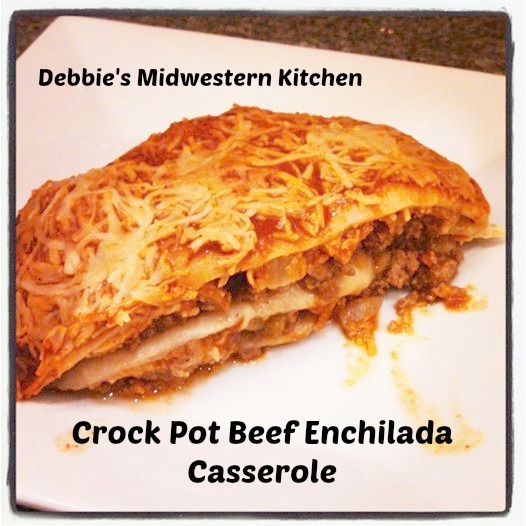 I’ll definitely try this using corn tortillas rather than flour. Welcome back, Debbie. I hope to see more posts when your bust schedule allows. I hope you enjoy this recipe! And I’m hoping to be doing a lot more posts in 2015. I miss it! Oh dear, oops, that should be busY.